House for 12 persons, with floor area of 63 m2. On the ground floor: living-room with fireplace, fully equipped kitchen, dining room, 1 bedroom for[lcizba] persons, bathroom. Upstairs: 5 bedrooms, 3 bathrooms. Rooms with bathrooms. Rooms are equipped with: TV, fridge, cordless kettle. Apartment consists of: 2 bedrooms, living-room, bathroom, balcony. On the premises parking lot. Bungalow consists of: 3 bedrooms for 2 persons, living-room, terrace, kitchen or kitchenette, 1-2 bathrooms. On the premises parking lot. House for 10 persons. On the ground floor: living-room with fireplace, fully equipped kitchen, dining room, 1 bedroom for[lcizba] persons, bathroom. Upstairs: 4 bedrooms for 2 persons, bathroom. Apartment consists of: kitchenette, bathroom, living-room, bedroom, terrace. On the premises parking. Additionally on the premises: place for grill, place for bonfire. At disposal fully equipped kitchen. On the ground floor: kitchen, bathroom, toilet, living-room with fireplace, terrace. Upstairs: 2 bedrooms, terrace. On the premises parking lot. House consists of: living-room, fully equipped kitchen, 3 bedrooms, 2 bathrooms, terrace with exit to the garden. The facility is open from May to September. On the premises: parking lot. To the forest 300 m. To the beach 150 m. We guarantee satisfying stay and nice atmosphere. House consists of: kitchen, dining room, living-room with fireplace, toilet, bathroom, 4 bedrooms. House is equipped with: TV, washing machine. On the premises garage. On the ground floor: living-room with fireplace, fully equipped kitchen, dining room, terrace, bathroom. Upstairs: 2 bedrooms, bathroom, balcony. On the premises: parking lot. At guests' disposal: satellite TV. WE INVITE YOU ALL YEAR ROUND!!! Bungalow consists of living-room, 2 bedrooms, kitchen, bathroom, terrace. Apartment consists of: living-room, kitchenette, bathroom, mezzanine. On the premises parking lot. Bungalow consists of: kitchenette, bathroom. On the premises parking lot. Apartment consists of living-room, bedroom, bathroom. At guests' disposal generally accessible self-service kitchen. Bungalow cottage, with kitchenette, with bathroom. Additionally on the premises brick grill in the garden, garden arbour. For children trampoline. For the active guest aquapark. 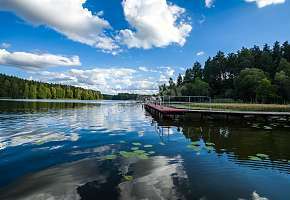 To the lake 80 m. We guarantee satisfying stay and nice atmosphere. Rooms are equipped with Internet access. Rooms with kitchenettes. On the premises parking lot. Bungalow consists of: bedroom, mezzanine, living-room, bathroom. To the lake 200 m.
Bungalow comfortable, cottage. Bungalow consists of 3 bedrooms, living-room with fireplace, bathroom. On the premises parking lot. Additionally on the premises place for grill. 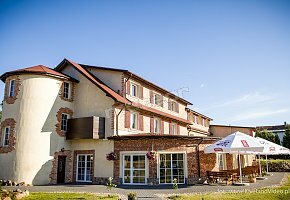 To the beach 120 m. We offer traditional Polish hospitality and relax in the beautiful region of Poland.